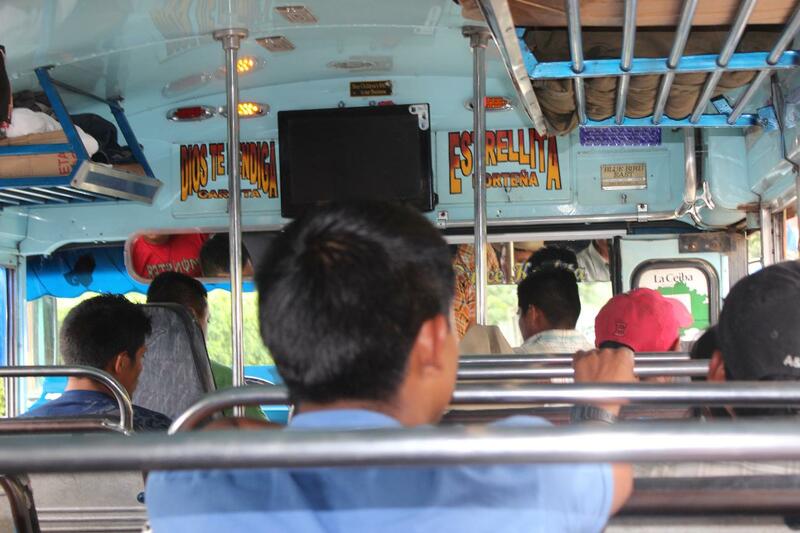 Chicken buses – the epithet comes from the possibility that you might be seated next to one – are the mainstay of travel in Central America. These old American Bluebird school buses, often repainted in the most garish of colours and adorning such adages as ‘Jesus Christ is the saviour’ and ‘Jehovah will show the way’, rattle and shake up and down any road that will ribbon out before them in the seven-country isthmus linking South and North America. Whether in the highlands of Guatemala with Mayan mothers and children in colourful traditional dress crammed in for another ride to the market or onboard as a madmen pilots one through the clogged city streets of San Salvador, belching forth toxicity as it threads and weaves through traffic at astonishing speed like a master embroiderer blazing high on amphetamines with a magic needle, one thing that you can be assured of on board is never being bored. Yet the chicken bus is so much more than transportation. While getting you from A to B it has a chameleonic knack of changing guise. My first-ever chicken bus journey had ended in an accident! Buses came to a halt and the drivers alighted. We craned our necks as obscenities flowed ‘mierda, hijo de puta, maricon’. Finally, it seemed that machismo in the form of clenched fists would settle the matter but a diplomatic intermediary was able to persuade them otherwise and soon enough we were on our way again. I was left to think, ‘did it really happen?’ No policia, no insurance exchanges. Just back on the road. The chicken bus is adventure. Campesinos plough and trowel rich, fertile volcanic earth under the perfect gaze of volcanoes that could have provided the blueprint for the conical hats worn by Vietnamese peasants half a world away. The varying vistas of landscapes, cityscapes, and kindly folk who people the lands rush by in a forever changing kaleidoscopic slideshow. The chicken bus is cinema. Every time that a chicken buses stops, which is often, sometimes to the point that you reluctantly resign yourself to a realisation that you actually may never arrive at your destination, it is swamped. Vendors converge upon the bus toting a variety of culinary offerings. They rap and tap on the windows. Knuckles of one hand meet the glass whilst the other holds up -like precious trophies- bags of all sorts of fruits and vegetables. With a knife and a bowl you could dine in your bus seat on your own freshly prepared salad. At the same time wrinkled señoras roam up and down the aisle of the bus, announcing their offerings in brusque voices; Tamales! Tamales! (Corn bashed and mashed into meal then steamed inside a huge banana leaf) or pollo frito! (Fried-chicken: in many cases barely any flesh, just the skin stretched around the bones like cellophane on sticks to form a cheap makeshift kite). You hand over your colones or cordobas, lempiras or quetzals, lean back and happily munch away. The chicken bus is market. Often folk will jump on, almost always men, at a point in the journey, stand at the head of the aisle and call for passengers’ attention only to then apologise profusely for doing so. They request with wholehearted zeal and compassion that they be heard. They orate in desperate voices to relate the tragedy that has befallen on the family; the little daughter that requires an organ transplant, the beloved wife with cancer. Operations and medication are expensive. The collective coins of the crowd can help. Almost invariably there are sceptics aboard and maybe some of the time they are right. Others believe in their honesty and integrity and hand over a coin. The chicken bus is charity. I remember on one chicken bus ride -from Somoto to Ocotal in northern Nicaragua- I came across a chap who had the clearest and crispest diction of any Spanish speaker I had ever encountered. His words and phrases departed his tongue like bright sparks flying from an angle grinder cutting through buttery concrete to clip my ears with immaculate sharpness. His voice was like a professionally sharpened, large kitchen knife of the highest quality and polished to glimmering superbness. Each word he uttered was akin to horizontally slicing spherical beads of dew into flawless hemispheres from where they lay on pointed blades of buffalo grass in the early moments of a summer dawn. Soon it was revealed that he was one of an ever-increasing brigade of evangelical preachers who take advantage of a captive audience to preach their message. Listening to his tone, his syntactic flow and his angelic oration was a pure, undiluted piece of beauty. It matters little if you agree with the message. The chicken bus is pulpit. The multifaceted nature of the ubiquitous and humble chicken bus goes on and on. It is also a medical clinic on wheels. However, it functions in a different, inverse way. Whereas in a standard doctor-patient relationship the patient describes his or her symptoms and the doctor consequently makes a diagnosis and prescribes a treatment, the chicken bus magic-pill peddler makes it his business to convince the passengers that they are suffering from all manner of debilitating ailments and would be doing themselves a great disservice if they did not avail themselves of the miraculous cures on offer. Like the evangelical preacher, the chicken bus physician is a master of oration and persuasion. He uses his words to inflict disease and illness. Each syllable that he utters shoots from his mouth like a needle of contagious saliva exploding from a sneeze and within the confines of the chicken bus epidemics are difficult to contain. A sudden outbreak of credulousness is not uncommon. Curiously, foreigners and the thrifty almost invariably possess a mysterious immunity. The chicken bus is a petri dish of contagion. The chicken bus is all this and it is more. It is a great constant and a cultural uniting presence through the region. In the seven countries that make up this petite isthmus linking the great continental spaces of North and South America the histories differ. Cross a border and the currency changes. The people are far from uniform. However, the heart and soul of the great chicken bus remain the same. They are faithful and indefatigable – always ready to rumble off into the unknown distance – and have such an endearing multifaceted personality that you might just fall in love. 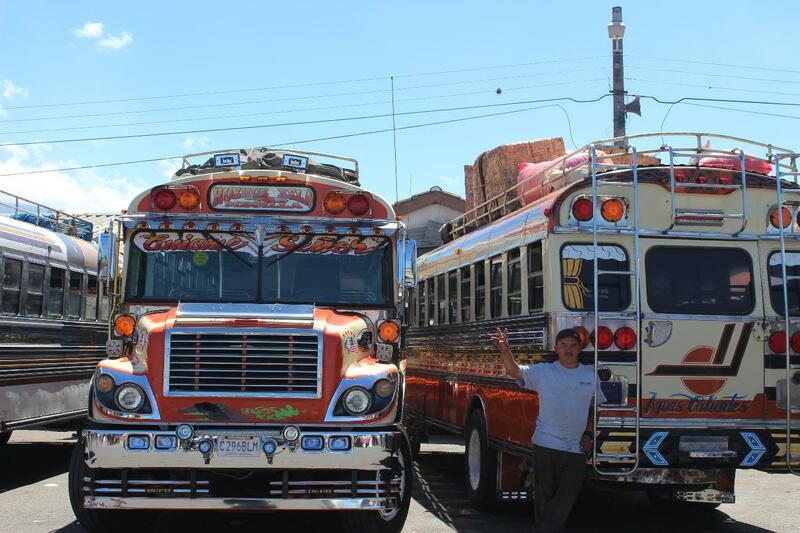 The chicken bus is Central America solidarity. The chicken bus is Central America. 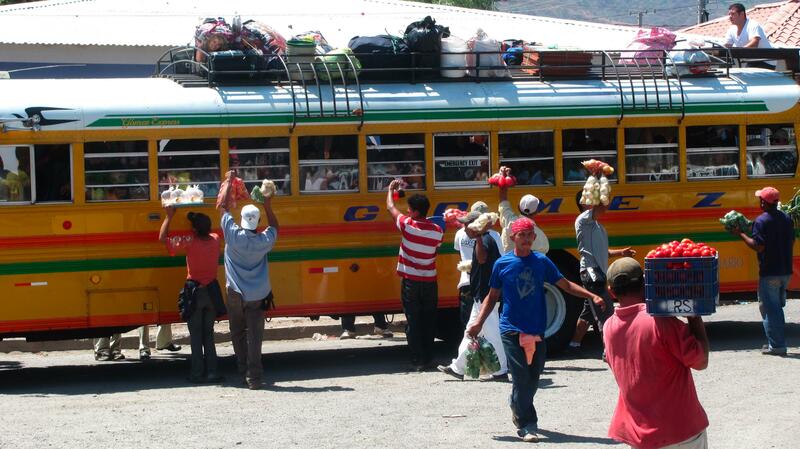 I will never forget my first chicken bus in Guatemala. I got on the bus and it was so full I told the man helping the driver that I would wait for the next bus. He just laughed at me and wedged me between two women in the aisle. We were so tight together that their hips were supporting me on either side. I had no seat underneath me, only the aisle, but I did not need one. We were scrunched together so much that we envied sardines in their can! Not for the faint or the claustrophobic, those buses. Thanks for bringing back the memories and doing such a great job! Thanks for your comment! That’s right, there’s always room for a few more! As challenging as they can be at times I love them! Regards. “Every time that a chicken buses stops, which is often, sometimes to the point that you reluctantly resign yourself to a realisation that you actually may never arrive at your destination, it is swamped.” This whole article really summed up my basic thoughts about Peruvian combis, but this line in particular brought it home. Imagine all of the points you just mentioned about the chicken bus happening in the space of a mini-van, and you’ve got yourself a Peruvian combi! Always an adventure, to say the least. “Every time that a chicken buses stops, which is often, sometimes to the point that you reluctantly resign yourself to a realisation that you actually may never arrive at your destination, it is swamped.” Thewhole article really summed up my experiences on combi, but this line is what really brought it home. Imagine all the events you described happening in a space no bigger than a mini-van, and you’ve got yourself a Peruvian combi. Always an adventure, that’s for sure. Thanks for your comment! I have a lot of memories about combi trips in Peru as well which provoked a whole gamut of emotions. I look forward to following your blog and hope to post something on Peru soon as well. Regards. Great read Peter…really enjoyed it. Thanks Bob! I was just remembering that ghost town we went through in Chihuahua. Creepy! You covered all the scenarios well, Peter. Riding the bus is never dull. I boarded one once in La Ceiba, Honduras with a frozen chicken and a dozen eggs in a plastic bag and had to stand in the aisle. It was so hot my chicken was thawing and dripping and I was trying hard to keep it off the neck of the woman I was leaning over. Thank you for your post. Thanks for your comment Kevin, I appreciate it. 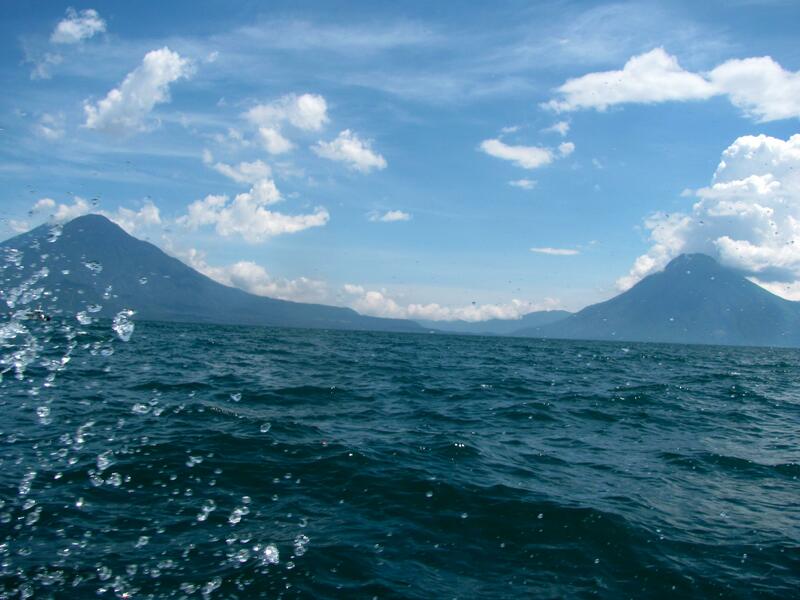 Sounds like you had an interesting experience on the journey from La Ceiba! 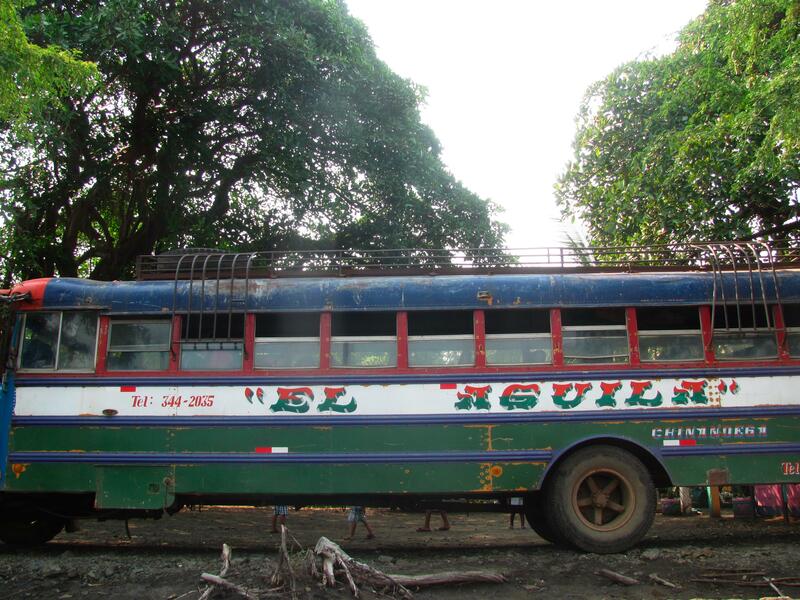 The journeys I made all over Central America by chicken bus are unforgettable. I lived in Mexico for a year and a half and there are similar buses although not as widely used but when I went on a short trip to Guatemala I was very excited to get back onto a Chicken bus! I’ve had a look at your blog, very interesting! Best wishes..
You summed it up well! On a recent chicken bus we had a guy dressed as a clown do a full routine, followed by the guy selling pills. I wonder why Central America has all these buses though? How did it start, did some entrepreneur get the idea to buy an American bus and it just caught on? Thanks Richard! I am not 100 % sure but I think that it started as a US aid program and spiralled from there. Just saw this one now. Great writing. Brings back memories, particularly of Guatemala and El Salvador. This line here: “His words and phrases departed his tongue like bright sparks flying from an angle grinder cutting through buttery concrete to clip my ears with immaculate sharpness.” Sweet poetry.